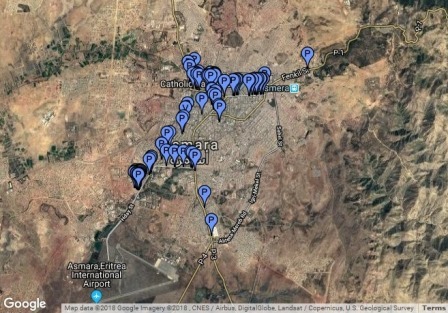 In early June 2018 Pieter Cronje visited Asmara in Eritrea and found a large number of weaver nests. Most nests he found were Baglafecht Weaver nests, and a few were Village Weaver nests. Together with Ruppell's Weaver, these are the most common Ploceus weavers in Eritrea. Although there were two PHOWN records from Eritrea previously, Pieter's sample has increased the number to over 100. This puts Eritrea in tenth place for number of PHOWN records per country (see country totals). Interestingly, most of the Baglafecht Weaver nests were found in palm trees, a nesting site known for this species (although as a site used occasionally). The nests of this weaver are built underneath the palm fronds, often near the trunk but sometimes closer to the tip of the frond.